Golden Krishna is a leading UX designer, UX guru and author of design essay “The best interface is no interface”, which has earned over 200,000 page views. We at Justinmind recently had the pleasure of speaking to Golden about his love-hate relationship with the user interface. In our chat, we talk about the consequences of screen beings everywhere and the power of the user interface – in this case, the lack of one. Check it out below, in the first of our two part special! Looking for a pdf of The Best Interface is No Interface? Just don’t forget to come back and read our interview with Golden too! Thanks for taking the time to speak to us today, Golden! Can you tell us a bit more about yourself and what you are currently involved in? Oh! And how much time in a day do you spend staring at a screen? It strikes when you least expect it. And when it’s happening in the most intense way, being a screen zombie removes you from awareness of anything and anyone around you. It’s awful. Terrible. Tech companies may not be polluting the air like the factories of the industrial revolution, but the societal pollution of this technological revolution is real, and like the coal-stained faces of those industrial revolution workers, the effects are just as visual at nearly every urban street corner, cafe, and home for this revolution. And like that air pollution ruined our lungs, the overuse of screens is having negative effects on us too. According to studies, have less empathy today then we did before because we spend less time looking at other human faces. The alone time we’re avoiding by staring into our phones and tablets means we have less creative, original thoughts. Studies show that staring into the light of our devices at night is robbing us of regular sleep cycles, and may even be a cause of breast cancer because the color temperature of our screens when viewed up close suppresses melatonin, a potential cancer-fighting agent. Not good, all covered in my book, and yes, being a screen zombie happens to me all the time. (Golden typing). Just replying to a text. Yeah, so I’m not sure how many hours I spend staring at a screen, but each time I fall into the zombie mode, my partner threatens she’s going to out the “no interface” guy on social media. I have to confess, I’m part of the problem because I work in tech. I started my technology career at Cooper, then I worked at an R&D labs for Samsung to create new products and services, then at an R&D group working on the future of Zappos, and now I’m at Google working on the future of Android. For the past few years, I’ve been trying to redefine our approach as an industry. I’ve been trying a better way to make technology than we do today. 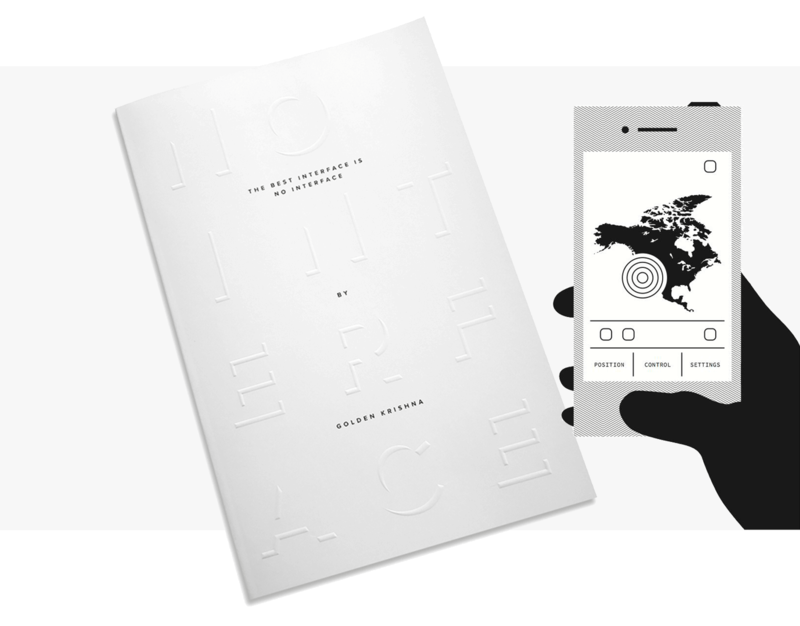 I’ve written this book, The Best Interface is No Interface, about what I’m trying to accomplish. It describes how and why we can do something better than make a world of screen zombies. How and why we can solve real problems in more profound, elegant, and brilliant ways. Sounds a bit nuts, but I think it’s utterly possible. The title of your latest book is “The Best Interface Is No Interface”. It’s certainly as bold as it is fascinating a statement! Can you tell us from where the idea stemmed? There was a time when our lives were filled with paper, and there were some people who were crazy enough to dream of a paperless world. Now, instead, today, our lives are filled with screens. And I think we should dare to dream of a screenless world. Yes, I actually think that the goal of every technological experience should be that the best interface is…no interface. Back in 1992, before the Internet was even widely available, Alan Cooper had a ludicrous idea, an action that’s still rare today: talk to customers. Go into homes, into natural environments, meet with people one-on-one, observe the way they actually use products and services, and then build personas to define behaviorally similar people to solve problems for them. By the time I joined Cooper, it was well-known for this kind of fantastic user research. I frequently traveled across America, sometimes across the world, in order to study the customers of our clients. About two years after the smartphone became popular, I started noticing a trend across so many groups of people: they didn’t want any more screen time in their already overwhelmingly busy lives. Yet, what clients wanted, what the industry was doing, what startups were aiming for was making more and more services in the hopes of getting people addicted to screens. To measure the quality of their digital products by the number of clicks and taps…gross. Eh, gross, gross. Makes me sick. That’s not what we’re here to do. Repeat it with me, we’re not here to get people addicted to screens. We’re not here to get people to get addicted to screens. We’re not here to get people to get addicted to screens. In 2012, I first wrote an essay about making screenless solutions. About changing how the entirety of our industry built and made technology. Why we need to change and better focus on the people we’re trying to help. Since then, I’ve been practising those ideas at Samsung, Zappos, and now at Google; and I’ve been discussing these ideas at conferences and events around the world. I’ve been lucky to have been requested — almost always unsolicited — to dozens of conferences around the world to discuss this provocative and absolutely necessary movement. There’s certainly been backlash. Look, some people have built their entire career around the processes to make screens and the psychological tricks to get you addicted to their digital services. It’s what our industry has been doing at least 10 years. So for me to say that what they’re good at is wrong, how they are manipulating people for revenue isn’t the right path, well, you can understand why they wouldn’t want to hear my on stage say that the best interface is no interface. You talk about our ‘obsession with screens’, and I totally agree. How do you think we got to the point where things got so out of control? When did UX design start getting blurred with UI? Essentially, when and why did we start making our lives more difficult rather than making them easier? In the late 1970s, the smartest people at Xerox had a fantastic idea: replace command line with point-and-click. With What-You-See-Is-What-You-Get (WSIWYG). Drag and drop. It was amazing. But in the nearly 40 years since that grand invention we’ve hardly evolved the primary interaction we have with computer. That’s sad. Opposite to the kind of innovation the technology industry is known for delivering. While progress with things on the backend and infrastructure that have created rapid Internet connectivity, fast cell networks, and incredible processing power; progress around the front end — what we do see, the graphical interface — has been devolving into psychological tricks. Improve your user interfaces with the best free wireframe tool. Download Justinmind. Today, being an app maker has gotten incredibly difficult, I think, because most consumers have started coming to the realization that they don’t need or want more taps and swipes in their lives. According to Quartz, the average American smartphone user downloads zero… yes, zero apps per month. People seem to download a few key apps — like email, maybe a social network, and perhaps a game — when they purchase their phone, and then never really download anything ever again. But I don’t think this behavior is symbolic to aversion of technology. I think it is symbolic of an aversion to awful, addicting technology that so many people in technology have been convinced that they need to make in order to be successful. I think there’s room in the market for something better. For something truly valuable. Products and services that are genuine. That want to solve problems in your life without the nefarious attempts to drive taps and clicks to their notifications. Interface: when is there too much? And when is less more? You say that there are too many apps, but surely you’re not suggesting that we get rid of all of them. What would the ideal app look like? When is there too much interface? Always. Ha. Well, okay. In the latter part of the book, I identify the exceptions. It’s actually a whole section dedicated to the naysayers — when they’re right and when they’re wrong. I identify moments when the best interface is not really no interface. Just as the brilliant modernist philosophy “Less is More” isn’t always true, “The Best Interface is No Interface” isn’t always true either, but there are many, many, many, many, many, many, many situations when it is. We don’t need more screen time in our lives. Already, adults in the United States stare into the light for over 11 hours a day. And this is scary: teenagers, who are mostly in school, look at screens for about 9 hours a day. That’s not good. Globally, we’re facing an epidemic of myopia. The very reputable journal Nature projects that around 80% of people living in many East Asian countries are myopic, or near-sighted, because children are stuck inside looking at things like, well, screens all day instead of being exposed to sunlight playing outside. Have you seen my new phone case? An overuse, an addiction to anything has consequences. In our screen-obsessed world, these are some of our consequences. The book actually covers even more. Look, screens, a liquid display, can have its rewards. Watching a movie can bring laughter into our lives. Documentaries can educate. Traffic signs can dynamically tell us about lane closures. Apps — as we dominantly think of them today, tapping and swiping, driven by buzzes and beeps — are not great, but there is actually a kind of app that I love. It’s a huge growth opportunity for app makers. The ability to make quieter, more minimal apps that can thrive. As a growing number of people have started to develop a health aversion to nasty, addictive products, there’s a growing crave for those things that can make our lives better. 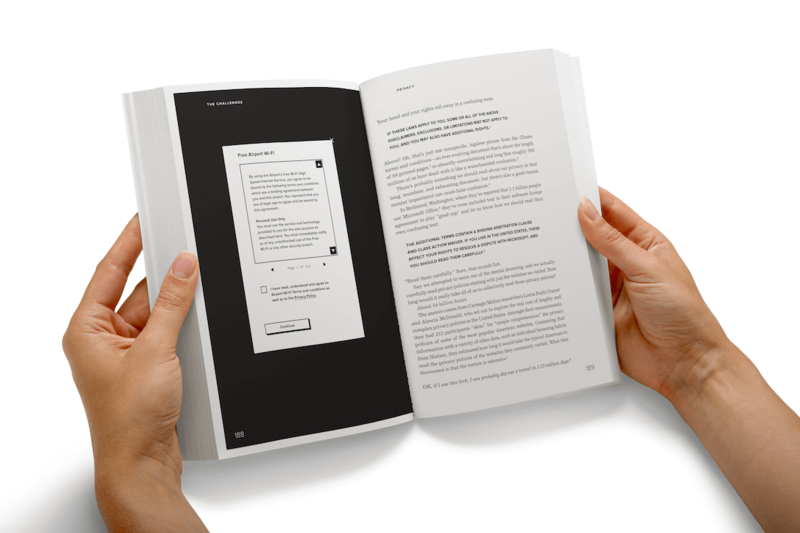 These are apps that live — as I describe in the book — in your back pocket. Or, Back Pocket Apps. These are apps that work while your phone just sits in your pocket. Apps that open doors, like Lockitron, which uses Bluetooth to talk to your door lock while your phone sits in your pocket. Or, like Ginger.io that has an app for people who are severely depressed. It looks for signals — not taps or swipes — like if you’ve left home today, if you’ve called friends and family, that could indicate depression and informs your mental health professional if things aren’t going well. I actually gave a talk about Back Pocket Apps in San Francisco at the Manifesto conference. You can watch it here. Click here for the second part of this awesome interview with Golden Krishna!